As I begin to write this post, the whole thing still feels so surreal. Part of me feels like I was just writing about my pregnancy with Eisley. And, quite unexpectedly, I have struggled much more with worry and fear this time around—probably because this baby feels much more long-awaited, and all I keep wondering about is how this could possibly turn out the way I hope. Could I really be that lucky? Although there have been only four years between pregnancies, I've changed in so many ways. Perhaps it's odd, considering I've already gone though this once, but everything seems much more fragile and scary to me now. Yesterday, I had my first official appointment with my OB and was pleasantly surprised to have another ultrasound. (I had my first around 9 weeks to confirm the due date.) Seeing that little baby with the strong heartbeat—especially having reached this point in my pregnancy—was such a weight lifted. The baby is okay. I'm okay. Just breathe. It's time to relax and enjoy this now. Symptoms: I'm truly convinced that I'm having a boy, because everything has been so different this time around. With Eisley, I my nausea lasted much longer and was much more intense, whereas this time I only had a few weeks where it was pretty dreadful. I continue to feel slightly under the weather, but the exhaustion far outweighs any morning sickness! I also have random cravings here and there (blueberry bagels, orange juice, spiral macaroni and cheese) and the one thing I haven't been able to even think about consuming for months is brewed coffee—something I used to always look forward to in the morning. As for other symptoms, there isn't too much to report, aside from having trouble sleeping. 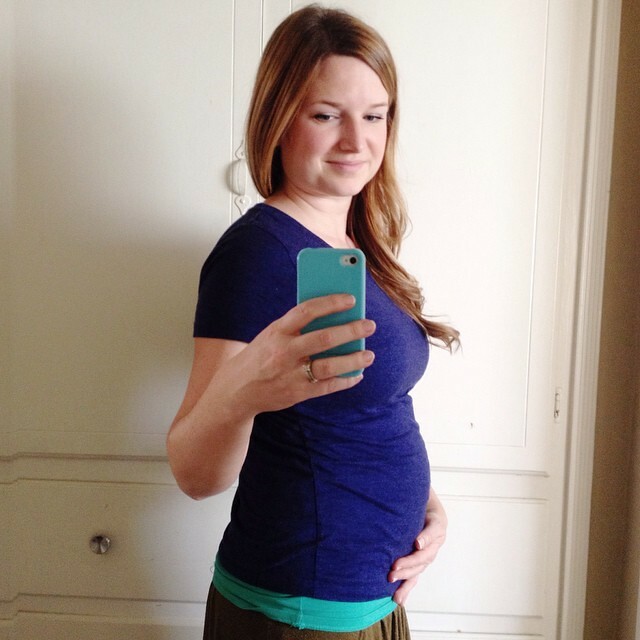 Body: With Eisley, I had absolutely no appetite for the first trimester (never gaining an increased appetite at all, actually!) and ended up losing almost 8 pounds by week 12. I haven't gained anything with this pregnancy, but the appetite is certainly there. I will even wake up with a growling stomach at 4AM, which is so bizarre. I'm still wearing regular clothes, but my jeans are being held together with a hair elastic, so…there's that. Miscellany: There are so many things I'm looking forward to. I can't wait to have a huge belly, to feel the kicks, to go through labor (I know; I'm weird…and hoping for as great of an experience as I had with Eisley's birth), to breastfeed, to baby wear, to see Eisley become the amazing older sister I know she will be. I worried about four years being such a huge gap in ages, but the more I think about it, I realize how perfect God's timing has been. I love that I had so many years to spend exclusively with my first child, and I love that she's going to be old enough to help out and fully understand how important being a big sister is. There's no knowing how the adjustment will go, but I'm feeling pretty positive about the whole thing. We shall see! It's just so crazy to think that by this time next year I will be a mother of two. Meredith just recently has gotten way more interested in baby dolls and the fact that Liam is a "baby." She really likes to look inside his diaper to see if he needs to be changed and she always declares, "He's fine." It makes me think about how much she'd LOVE having a newborn right now. Eisley is really the perfect age! Congratulations, Kerri! I'm very happy for you, Jay, and Eisley. I always hear that boys aren't as worse with morning sickness as girls are. Hopefully when we conceive I'm not too sick. That bump looks SO GOOD on you!!! <3 I am very pleased there will be more little you's and Jay's running around. Amen. Eeee I'm just so excited for you! And oh man the exhaustion, so much exhaustion. I praise you for dealing with the exhaustion and having a four year old, sweet mercy, ha.